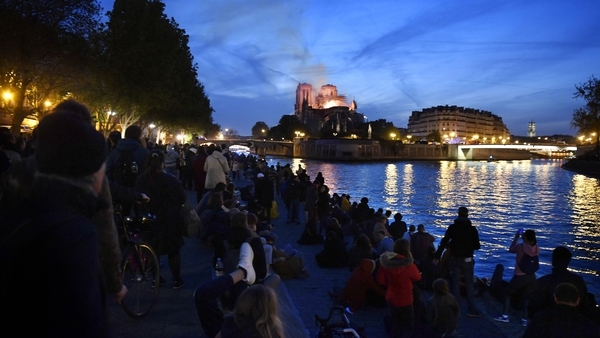 French President Emmanuel Macron has vowed to rebuild the Notre-Dame Cathedral "even more beautifully" within five years, as France reeled with shock from the fire that gutted the great Paris landmark. Mr Macron announced the fast timescale - for a process some experts said would take decades - in an address to the nation where he hailed how the disaster had shown the capacity of France to mobilise and unite. "We will rebuild the cathedral even more beautifully and I want it to be finished within five years," Mr Macron said from the Elysee Palace. "And we can do it." "What we saw last night in Paris was our capacity to mobilise and to unite," Mr Macron said, hailing France as a nation of "builders". 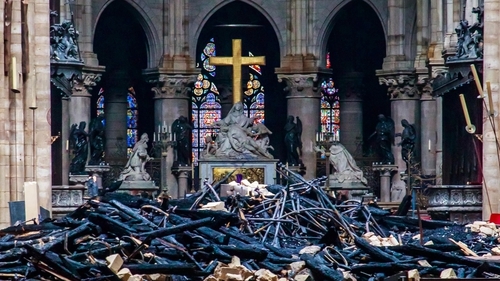 Images from inside the cathedral following the fire showed its immense walls standing proud, with statues still in place and a gleaming golden cross above the altar. US President Donald Trump relayed Americans' "condolences" to Mr Macron over the fire, the White House said. French fire chiefs had earlier dismissed as "risible" comments by Mr Trump that the fire should be tackled with water bombers, saying this risked destroying the entire edifice of the cathedral. The Paris fire service said that the last remnants of the blaze were extinguished 15 hours after the fire broke out. "Nothing indicates this was a deliberate act," Mr Heitz told reporters, adding that 50 investigators had been assigned to what he expected to be a "long and complex" case. French billionaire Bernard Arnault and his LVMH luxury conglomerate, rival high-end designer goods group Kering, Total oil company and cosmetics giant L'Oreal each pledged €100m or more. Many more came today to the banks of the river Seine to gaze at where the roof and steeple once stood.